Dr Henning Gericke – Motivational Teamwork helped lead the Springbok Rugby team to victory in 2007. Through his expertise, he offers team building to sales teams and conferences. Dr Gericke is now available through Conference Speakers. Dr. Henning Gericke was the Team Psychologist for the Springbok Rugby Team and was in France with the team for the IRB Rugby World Cup 2007. Among the Springbok players, he was nicknamed the Head Doctor – ‘Kopdoktor‘. Follow Dr Gericke on Facebook. In the early 1980’s, he broke the 4 minute mile on 10 occasions and was considered a potential medal hopeful at the 1984 Olympic Games in Los Angeles. However, he was unable to compete due to the international isolation of South Africa at the time. Dr Gericke has helped teams such as The Pumas, The Blue Bulls and the Sharks rugby teams reach their maximum potential and was asked to join the South African Rugby Union in 2004 as the Team Sport Psychologist. 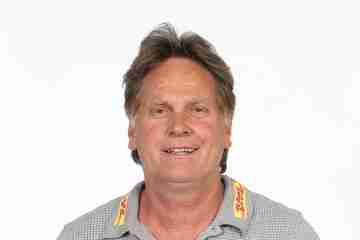 Dr Gericke was involved with the Soccer Confederation Cup and in January 2010 he had a camp in Durban with the Bafana Soccer team to prepare them mentally for the World Cup in June 2010. He was also involved with Protea One Day Cricket series in 2010 – 2011 and was part of the management team in India last year at the Cricket World Cup. What do World Champions in Sport and Business do that sets them apart. Dr Henning Gericke-Motivational Teamwork provides a well-rounded talk as a Professional and After Dinner Speaker through his experience with the Springboks as well as many others ideas that focus on Sports Psychology that can be used in the corporate world. Champions in 2007 and mentally prepare Olympic Champion Cameron van der Burgh to achieve his life-long dream, Dr Henning Gericke has a wealth of insight into the mind of the champion. 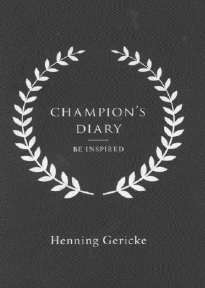 In this book, Gericke brings together years of experience in working with champions, helping them to develop their dreams, empowering them with the mental skills, resilience and composure to achieve them, as well as instilling the winning habits which are crucial to the champion mindset. Each of the 41 chapters discusses a crucial aspect of the champion’s journey effectively, blending principles of psychology, Eastern philosophy, inspiring anecdotes and powerful quotations. 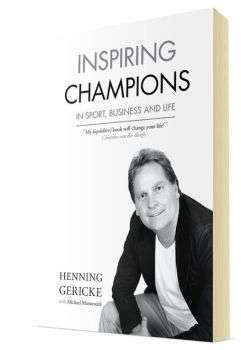 After each chapter, Gericke draws on his impressive repertoire of South African champions, and famous sports stars and coaches to share their personal ‘Green and Gold Stories’ and add muster to his teachings. Cameron van der Burgh, Os du Randt, Bob Skinstad, JP Duminy, Francois Pienaar, Breyten Paulse, Graeme Smith, John Smit, Pierre Spies, Leon Schuster, Bismarck du Plessis, Schalk Burger, AB de Villiers, Jacques Botes, Rassie Erasmus, Zola Budd, Dale Steyn, Ryk Neethling, Ernie Els, Jacques Kallis, Dan Skinstad, Jean de Villiers, and Bryan Habana. “I strongly believe that the Champion’s Diary will be the road map to having your best year yet. This applies to your business, the sports field and life in general”. “The way of the champion is all about challenging bad habits and connecting to new ways of thinking, feeling and doing”. In this Champion Diary, you will be challenged every two weeks by an inspirational theme with powerful success principles. Inspirational stories and daily quotes will be your guide to conquer life’s challenges and the goals for which you have long strived. You will benefit from the Champion’s Diary if you are serious about investing in yourself and you are willing to grow to become the best that you can be. 2004 – 2007: Springbok Rugby Team: Rugby World Cup champions, Player, Coach and Team of the Year. 2008: Sharks Rugby Team: Currie Cup Winners. 2010: Working with Bafana players at training camps in preparation for FIFA World Cup 2010. 2012: Working with the South African Olympics Swimming Team 2012. A keen athlete himself, he has personal experience in both the highs and lows of competition, and knows what it takes to break the mental barriers which inhibit us from succeeding. Gericke lives with his family in Pretoria.